Two adult unmentionables–both of them male–busied themselves feasting upon the flesh of the household staff. How two zombies could have killed a dozen servants, four maids, two cooks, and a steward was beyond Elizabeth’s comprehension, but she knew precisely how they had gotten in: The cellar door had been opened to let in the cool night air and relieve the oppression of the woodstoves. “Well, I suppose we had ought to take all of their heads, lest they be born to darkness,” she said. Mr. Bingley observed the desserts his poor servants had been attending to at the time of their demise–a delightful array of tarts, exotic fruits, and pies, sadly soiled by blood and brains, and thus unusable. Elizabeth thought she detected the slightest smile on his face. She watched as Darcy drew his blade and cut down the two zombies with savage yet dignified movements. He then made quick work of beheading the slaughtered staff, upon which Mr. Bingley politely vomited into his hands. 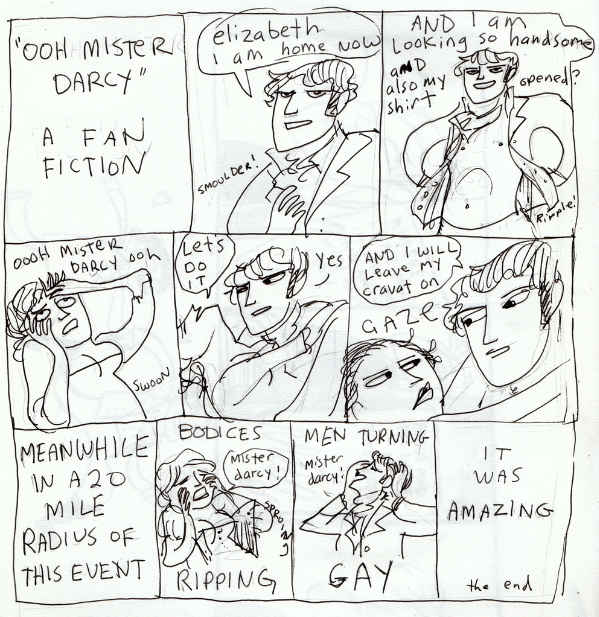 There was no denying Darcy’s talents as a warrior. Elizabeth and Darcy merely looked at one another in awkward silence, until the latter reached both arms around her. She was frozen–“What does he mean to do?” she thought. But his intentions were respectable, for Darcy merely meant to retrieve his Brown Bess, which Elizabeth had affixed to her back during her walk. She remembered the lead ammunition in her pocket and offered it to him.